Historically, sea turtles were considered to be an economically and culturally important food source throughout the Caribbean. Since the discovery of the New World, sea turtle populations throughout the Caribbean have plummeted, leading to the classification of sea turtle species as endangered or critically endangered across the region. This led the Department of Marine Resources of the Bahamian Government to implement a Bahamas-wide ban on the harvesting of sea turtles in 2009. The Sea Turtle Research Program has been in place at CEI since 2012 and has focused on the biology and ecology of green sea turtles (Chelonia mydas) around South Eleuthera. 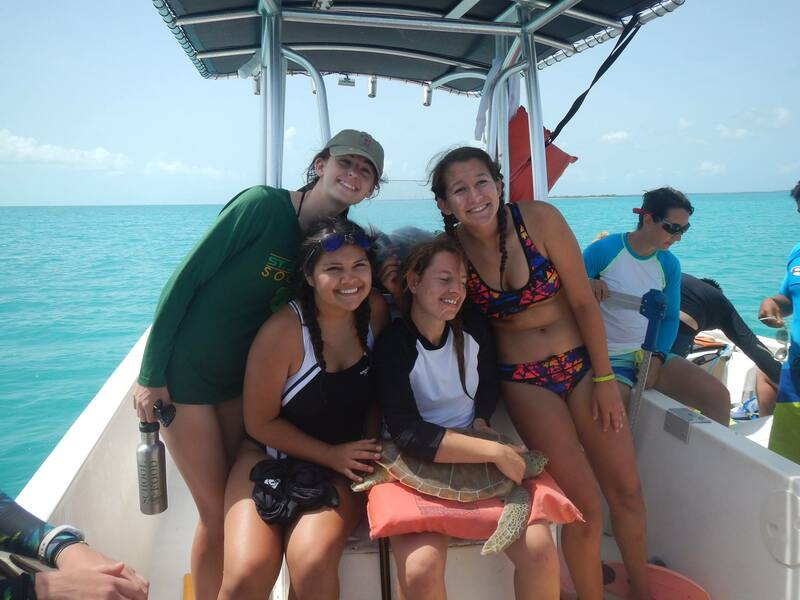 This Fall, the program embarked on a brand new study focusing on the social side of sea turtle conservation with Rachel Miller, Research Assistant, and her Island School Research Class leading the charge. 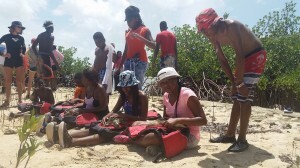 This project is designed to assess the gaps in knowledge between Bahamians and researchers as well as the attitudes of Bahamians towards sea turtle conservation, particularly the 2009 harvesting ban on sea turtles, through the use of a semi-structured interview. 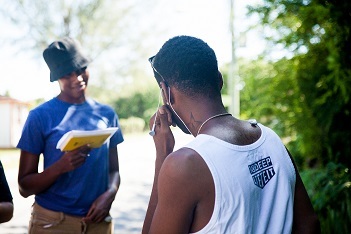 So far, 72 interviews have been conducted and data has been collected from 69 individuals who live in 9 different settlements across Eleuthera, plus 3 interviews from Bahamians visiting from Nassau. 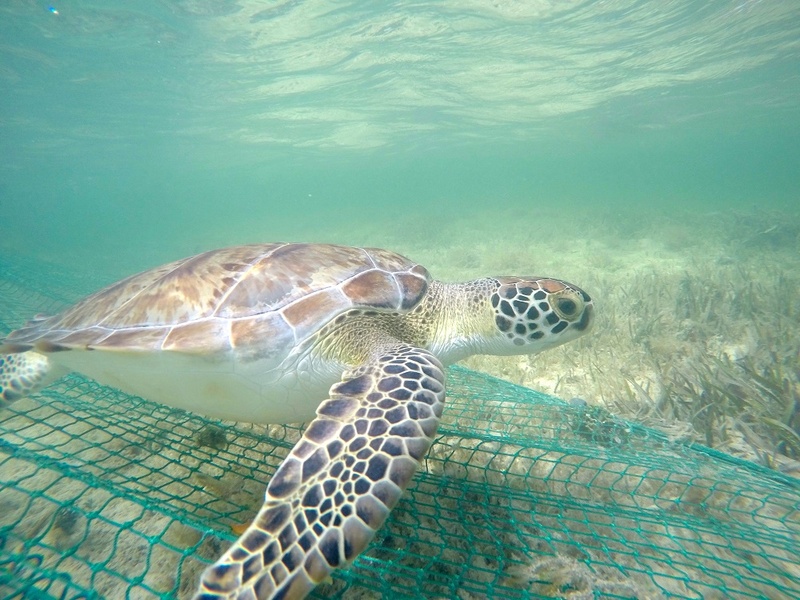 Preliminary data shows that of the 69 interviews from Eleuthera, 64% of interviewees (n=44) are aware of the 2009 harvesting ban on sea turtles. 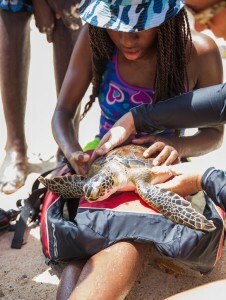 96% of interviewees (n=66) have a positive reaction to sea turtle conservation, stating that it is important to protect sea turtles in The Bahamas. The Island School students will analyze and present their results during Parent’s Weekend at the end of November. The overall goal of this study is to highlight what Bahamians know about sea turtles and how they feel about sea turtles. This information can be used to create effective outreach and awareness programs throughout Eleuthera and the rest of The Bahamas. 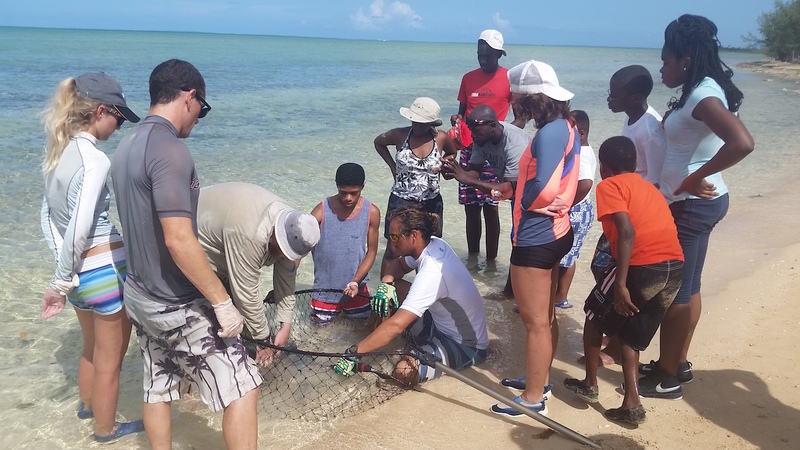 The Sea Turtle Research program is excited to begin partnering with other organizations to continue this study on other islands and reach more communities. We thank everyone that has participated so far! While all visiting groups are special to us here at CEI, certain ones touch our hearts in unique and unexpected ways. Akhepran International Academy, visiting us for the first time from Nassau, was one group that made a big impact in their short time with us. 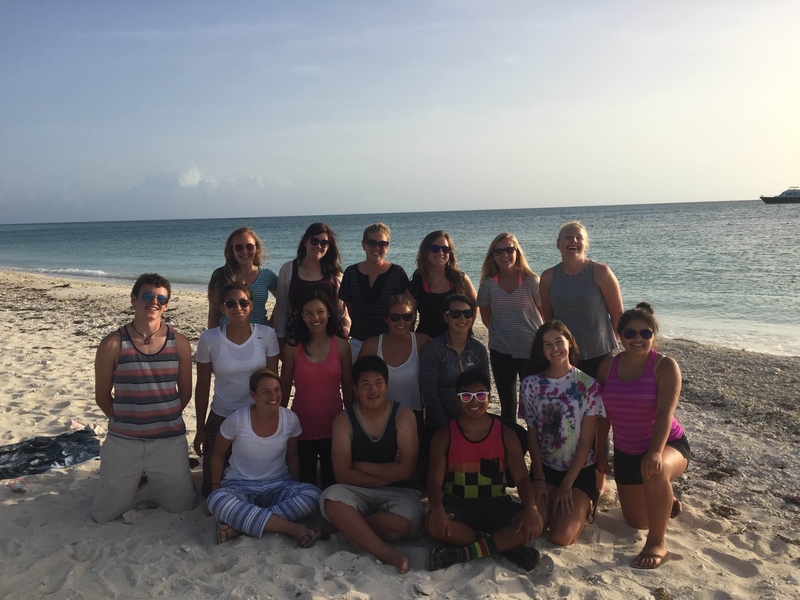 On Monday August 24, 10 students along with 2 teachers arrived from New Providence and jumped straight into the island school life. They had a jam packed day to orient them to our campus, complete with a sustainable systems tour and awesome day one snorkeling. The rest of the week had a large emphasis on working with our research teams and discussing the implications of their work on our world. Lloyd Allen, head chaperone and a teacher at Akhepran, has a big vision for his scholars and hoped that in their time here they would see the plethora of career options in sciences and engineering and be inspired to pursue their passions. Some students have dreams of being engineers. These students really enjoyed learning about our aquaponics system with Michael Bowleg and spoke excitedly about going home and engineering their own aquaponics system at home. 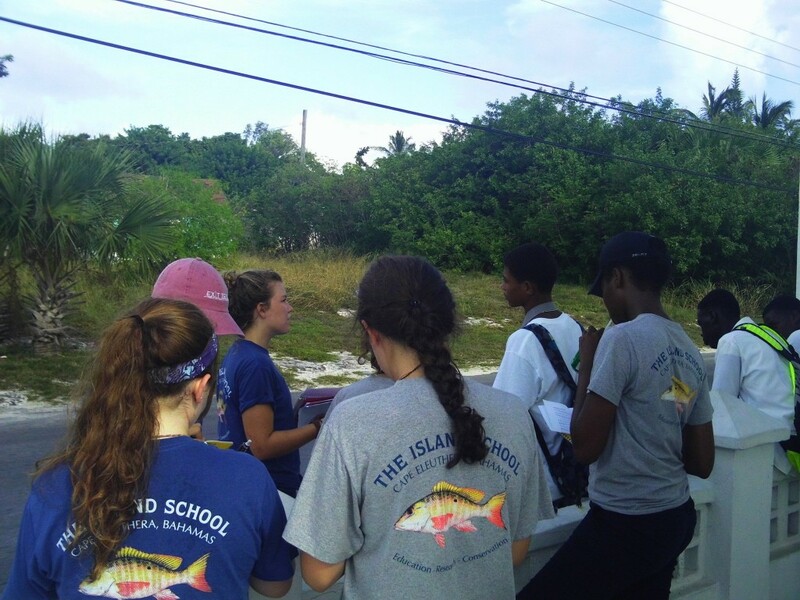 Others dream of being marine biologists and, after a morning learning about and dissecting lionfish, want to go back to Nassau and tell everyone they know about this invasive species and get them to eat lionfish instead of more commonly overfished species. These examples are just the beginning of this group’s studies. 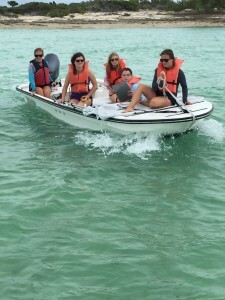 Students assist researchers by helping to catch southern stingrays. Their curiosity, questions, and positive approach to life made them a joy to spend the week with. By the end of the week many spoke about how their perspectives on the ocean had shifted and they had learned to love the ocean they grew up around even more. One student said, “every time a wave hits against me it’s like a kiss from mother nature” and another admitted that she had fears about the ocean, but that swimming in it and “being one with the fish” showed her she didn’t need to be so afraid. This was truly a week of growth and inspiration, and even though their trip was cut short by threats of a hurricane, we look forward to this relationship and have hopes to visit their school in Nassau in the future. Professor Duncan Irschick of University of Massachusetts visits CEI! 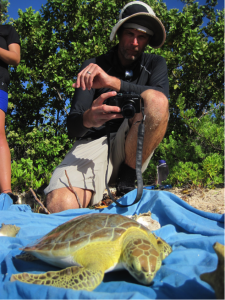 Professor Duncan Irschick, integrative biologist and innovator at the University of Massachusettes, recently visited Cape Eleuthera Institute for an exciting week of field work with the Sea Turtle Research and Conservation (STRC) team. Far from being his first visit to CEI, Prof. Irschick is working in collaboration with the STRC team on a novel project to investigate the relationship between life stage and body shape of green sea turtles; how does flipper shape and carapace (shell) shape change with age and what implications does this have on the animal’s fitness? Over the course of the year, STRC researchers have been capturing digital images of the flippers and carapace of individual green turtles as data for investigating this interesting question. The primary focus of Prof. Irschick’s visit this time, however, was to take a series of high quality digital images for each turtle that was captured during the week. With each photo in the series taken from a different angle to the turtle, Prof. Irschick is able to use a software program to create a 3D digital model of the turtle. His hopes are that with the use of 3D printing, these perfect replicates of real-life turtles can be used as an interesting and interactive educational tool. 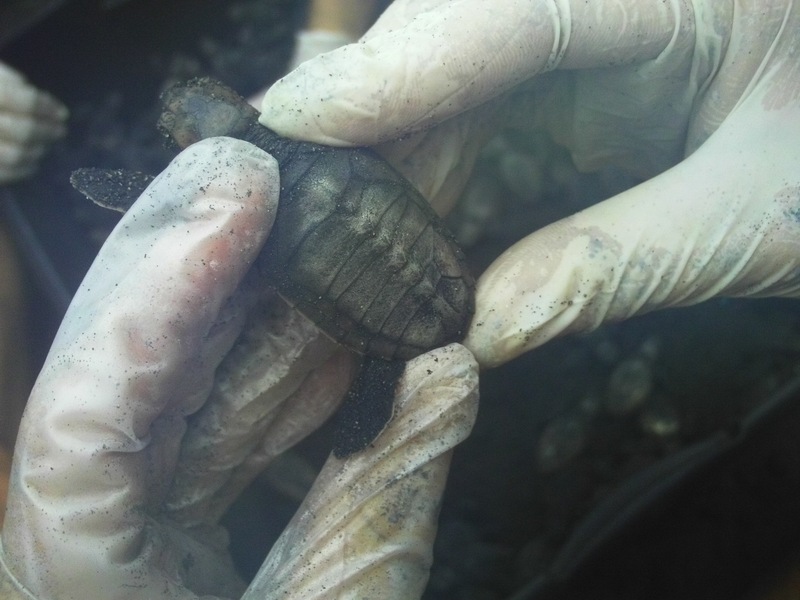 During the week, we caught a total of 11 turtles for Prof. Irschick’s 3D modelling – a very successful week! Mid-week, the staff and visitors of CEI were treated to an evening presentation by Prof. Irschick entitled ‘Bioinspiration as a way of understanding the world’. This talk gave insight into how biological form can inspire synthetic design and touched on the striking similarity between the shape of bicycle helmets and sea turtle carapaces and how, by studying the form of gecko feet, a collaboration at the University of Massachusetts was able to apply anatomical principles to create a gecko-like adhesive called GeckSkin TM. His presentation was met with a host of questions on this inspiring topic and has certainly left us looking at the form and function of organisms in a new light. The new multinational Sea Turtle Team ready to go for the Fall! 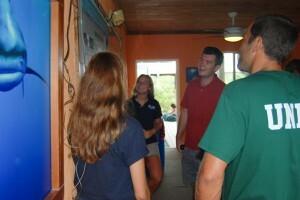 The Sea Turtle Research and Conservation team here at CEI welcomes three new members to the team for the fall semester! They arrived last Saturday and, after a few days of orientation, they got to finally jump on a boat and head into the field. Despite the early finish due to unpredictable weather conditions, all the interns had an amazing time getting hands-on experience in working with Meagan Gary on her Masters study by monitoring for sea turtles carrying her acoustic tags. 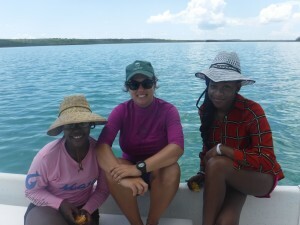 Brittany Bradshaw (left), who had the task of listening for sea turtles, is a 21 year old college graduate from the University of the West Indies St. Augustine campus (Trinidad and Tobago), where she did her BSc. in Biology and Environmental Resource Management. Although she came from a Caribbean island, she honestly believes without a doubt that Eleuthera is the hottest place in the world! Brittany is excited to learn and will be spending her free time scuba diving and participating in projects with the other staff members at CEI. Anna Safryghin (middle), manning the hydrophone, is a 21 year old half Italian and half Russian placement year student from Plymouth University, UK. Anna studies Marine Biology and Coastal Ecology and also plays soccer for the University team. She left the freezing Russian cold behind her to come and enjoy the hot and stunning Eleuthera. In her free time, Anna can usually be found engaging in some kind of physical activity, from water polo Wednesday to volley ball Tuesdays. During her 6 months at CEI Anna is looking forward to gaining experience in the field in all ways possible. Last but not least, there is Jorell Pageot (right), who did a great job recording the positions of the turtles during her first field day. She is an 18 year-old, recent highschool graduate, from the not-so-far Nassau, New Providence. Jorell has been so enthusiastic about everything since her arrival. It is actually her first time on any of the family islands and so far she is “loving it”! Jorell looks forward to working with the turtle team and learning new things, she plans to become a marine biologist and is already looking at colleges to begin her studies to achieve that goal. Jorell loves meeting new people, soccer, and she wants to become a certified scuba diver. We look forward to working with this team for the rest of Fall 2015! 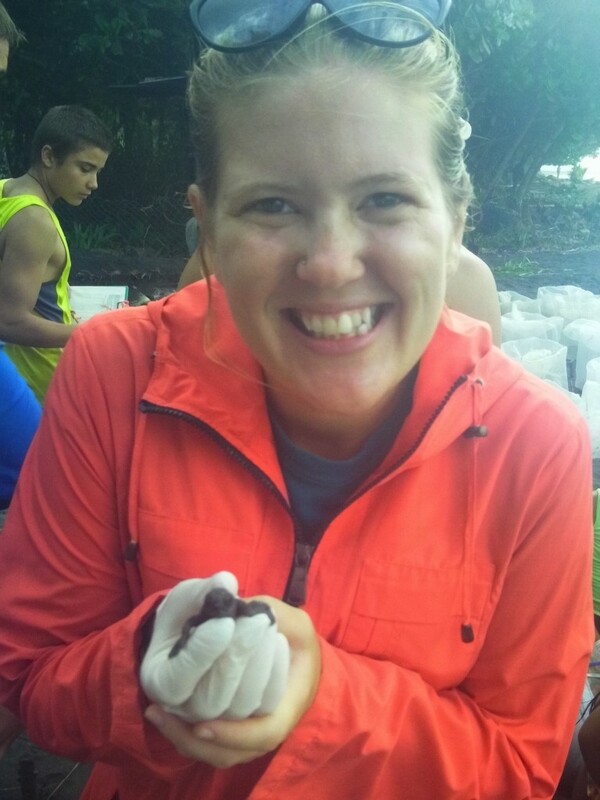 For two weeks in early July, Rachel Miller, Research Assistant for the Sea Turtle Research and Conservation Program, headed to Costa Rica to lead a marine biology summer camp. 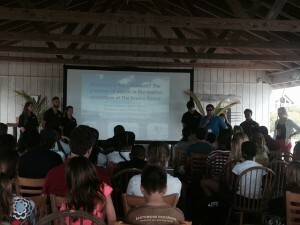 This camp was comprised of 8 high school students from all over the United States who came to Costa Rica to learn more about worldwide sea turtle conservation initiatives and to help better the community. The camp worked in conjunction with WIDECAST – Pacuare, a conservation program located on the Caribbean coast of Costa Rica. Here, Rachel and the campers had the opportunity to assist with hatchery construction, night walks, and hatchling releases. Even though it is illegal, poaching is a major issue in Costa Rica, especially in poorer communities. These communities have subsisted on the consumption and sale of turtle eggs and meat for decades. However, WIDECAST – Pacuare is working to combat poaching through the use of night walks (led by former poachers, used as an alternative source of income), a guarded hatchery (used to monitor relocated nests and protect the eggs from predators and poachers), and education initiatives (public hatchling releases, lectures, and social media). 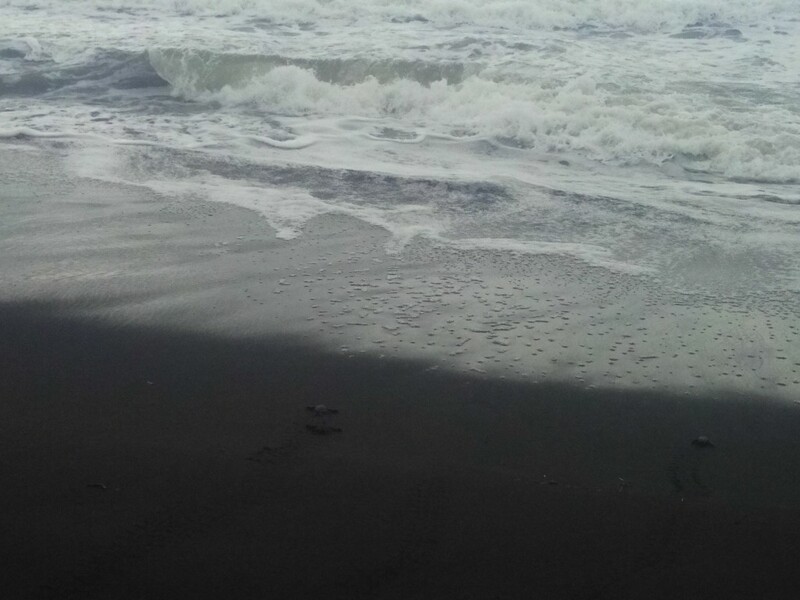 During their time in Pacuare, Rachel and the campers got to see leatherback hatchlings make their way into the sea and on the last day, they were rewarded with a hawksbill hatching! It is common for leatherbacks to nest on the Caribbean coast of Costa Rica from February until the end of June and the babies begin to hatch in May until the end of July. Hawksbill sea turtles, however, nest less frequently, and there were only two hawksbill nests in the hatchery during the time the camp was taking place. Not only was the hawksbill hatching special in and of itself, but the nest consisted of 9 hybrid hatchlings– these babies were the result of a successful mating between a hawksbill and a Kemp’s Ridley. Unlike most hybrids, the offspring of a hawksbill and Kemp’s Ridley are thought to be fertile and it is believed that this is the fourth generation of these hybrids. 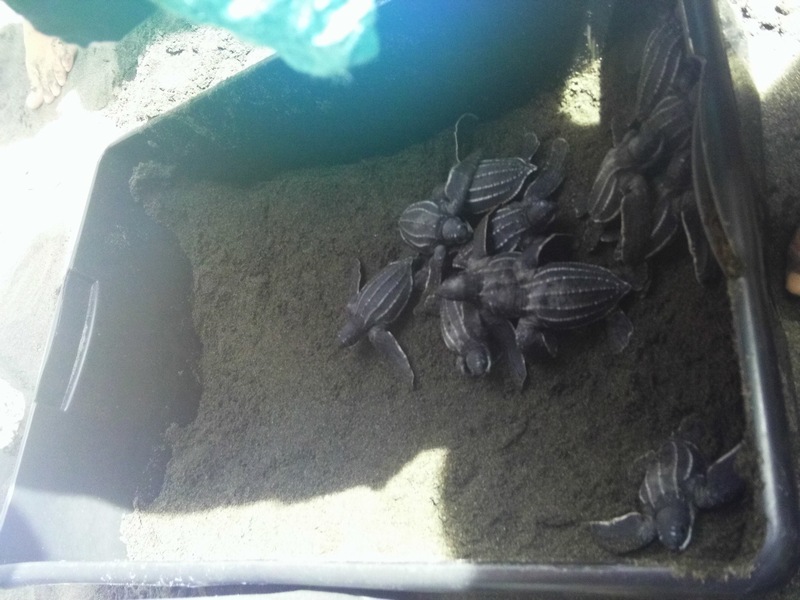 The reason that all 120 hatchlings were not hybrids is because many sea turtle nests have multiple paternities, resulting in typical hawksbill hatchlings and hybrid hatchlings. Rachel and the campers came away from this trip with a better understanding of how conservation works outside of the United States. It is often difficult to enforce laws and regulations, especially if people are reliant on an organism for food or income and if that community has no other source of income. Sea turtle populations continue to be exploited, but conservation efforts are in effect worldwide, and protecting eggs and nesting mothers helps to aid in the redevelopment of healthy sea turtle populations on a global scale. For more information on the project in Pacuare, click here. The Sea Turtle Research Team recently said goodbye to their first Earthwatch team of the summer, and we are sad to see them go. The group of 7 students and 4 chaperones from Santa Maria, California were very enthusiastic and eager to participate in all activities. The group’s visit was concurrent with the summer intern’s first week at the Cape Eleuthera Institute, so lots of learning was had by all. Our work done in the field with Earthwatch included abundance surveys, BRUVS (baited remote underwater video survey) setting, as well as catching and tagging turtles through seining and capture off the boat. Jules, a fast swimming student from the Earthwatch team, caught the first turtle, named ‘Seawater,’ setting the mood for the week to come. Our most successful turtle capture was on the last day, with a total of 10 turtles caught in our seine net at Half Sound! With one recapture and 9 new individuals being tagged, it added a significant amount of turtle individuals to our overall count with sizes varying from 257mm- 357mm. A green turtle caught by the seine net. Other highlights of the week included excursions to the ocean hole and caves in Rock Sound as well as a down island trip with lots of stops along the way. On a day off, the team got to see a bit more of Eleuthera, stopping at the Glass Window Bridge, and Governors Harbor. 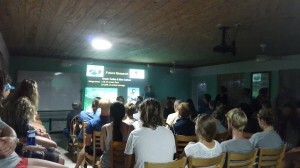 Evenings consisted of presentations given by Cape Eleuthera Institute faculty about their research including information on sea turtles and manta rays. They also spent two evenings recording data from the BRUVS they had set out earlier in the day by watching the film and looking for predators and they saw- barracuda, nurse sharks, and even a green turtle. “I genuinely will miss this place and will cherish everything forever,” said Eugene Kim, one of the student volunteers as his closing remarks. Our next group arrives at the end of July! On Saturday, June 6, Spring 2015 Island School students participated in the Research Expo, their final Research Class assignment, which coincided with the Youth Action Island Summit hosted at the Island School. For the Research Expo, each group was required to focus on the “bigger picture” of conservation in their research area and present their conservation message through the use of games, trivia, slide shows, and their Research Poster. At the end of the Research Expo, the Spring 2015 Plastics Research Group presented their findings to everyone in attendance. The audience was very impressed, with one Summit attendee praising the students for doing graduate level research in high school. Overall, the Research Expo was a success. The students enjoyed meeting people of various backgrounds, answering questions about their research, and demonstrating all that they have learned this semester. Their final research posters, which were displayed at the Research Expo, can be found here. 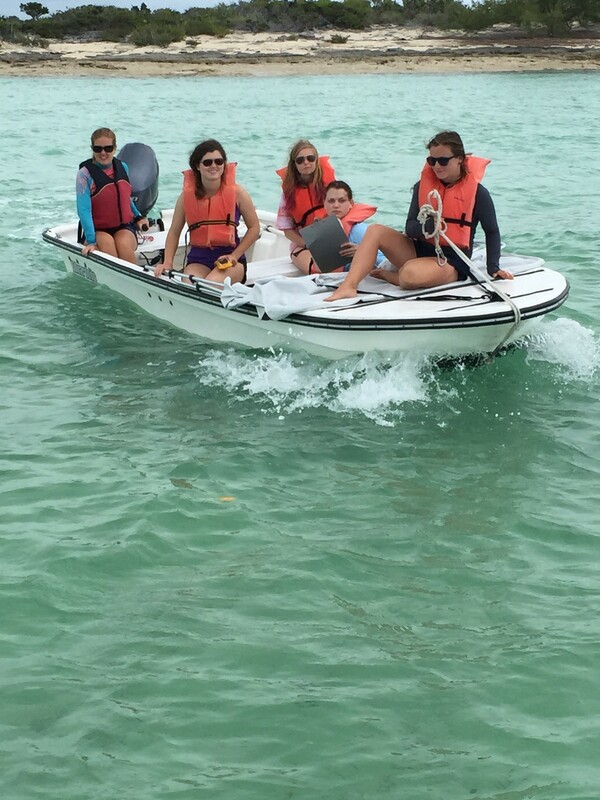 Phoebe Shuylor, Emma Ward, and Rachael Alberts head to the creeks with Rachel and Grace from the sea turtle conservation team to do sea turtle abundance surveys. Earlier this May, we welcomed the very FIRST group of female students to ever visit CEI from Tandem Friends School in Charlottesville, Virginia. This trip was planned as part of their school’s Emphasis Week, a time where students have an opportunity to travel and immerse themselves in learning experiences outside of the classroom, and they couldn’t have picked a better place! The group spent a week exploring the reefs and creeks around South Eleuthera, adapting to living sustainably, and doing things that they might not be able to anywhere else in the world! 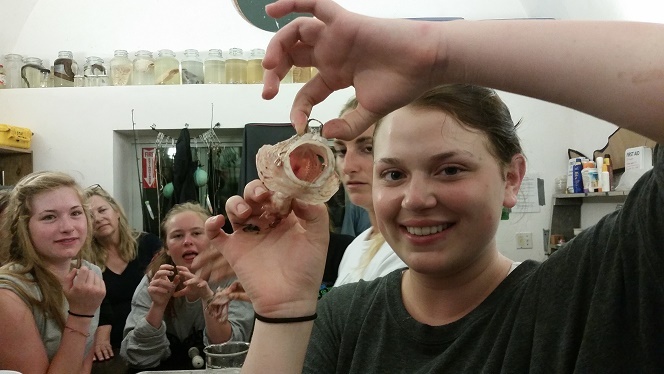 Admiring a lionfish’s gape during a dissection with the sustainable fisheries team. 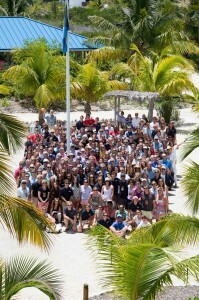 Last week The Island School hosted Parents’ Week. The week included an opportunity for parents to tour our campus, view a student art exhibit, parent-teacher meetings, and a day for students to show their families the island of Eleuthera. 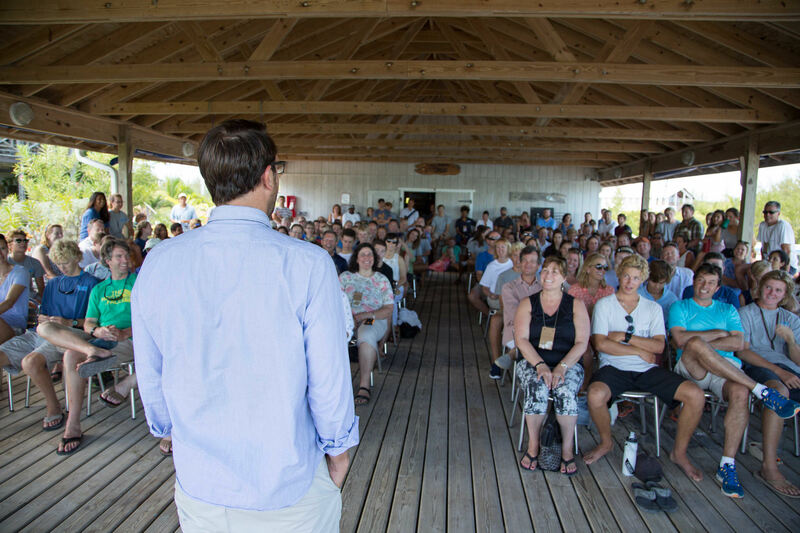 The head of Island School addresses all of the visitors before presentations begin. 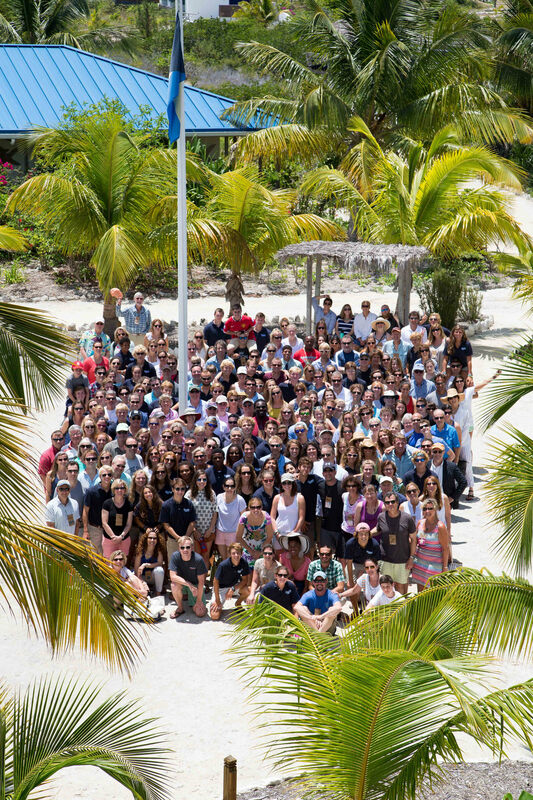 52 excited Island School students had the opportunity to present their semester long research projects to their parents, real world scientists from The Cape Eleuthera Institute, and The Island School faculty. Each research group had 10 minutes to present the culmination of their semester’s work including an introduction to their project, their hypotheses, a description of methods employed, results section, and conclusions of findings from their data. 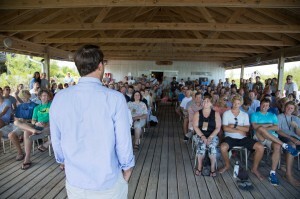 In addition, each group answered questions from curious parents and researchers about their topics. A group shot of The Island School students, staff, CEI researchers, and visiting parents. 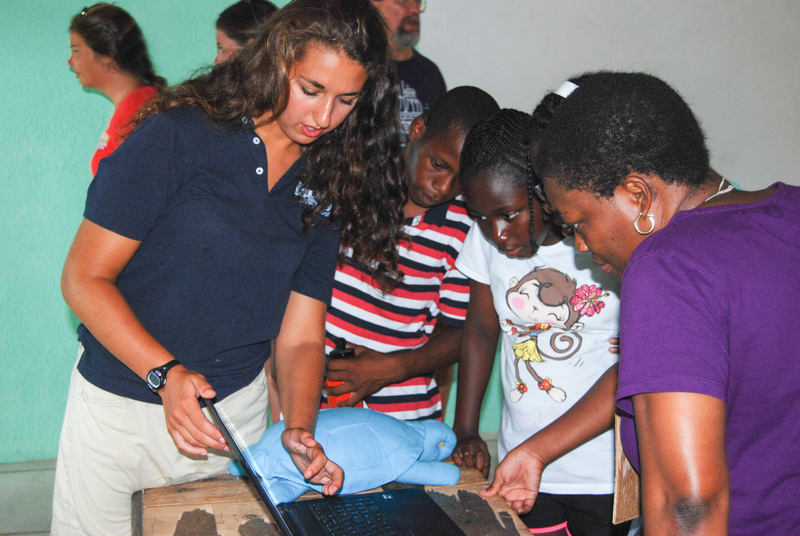 The parents learned about how plastic pollution can end up in a fish’s stomach, exciting new research focused on the deep-sea, the current status of important fisheries species in South Eleuthera and new research focused on the inland pond systems in Eleuthera. Guest commented on how impressed they were with The Island School students’ level of professionalism when presenting and their ability to share in-depth knowledge on their chosen research topic. 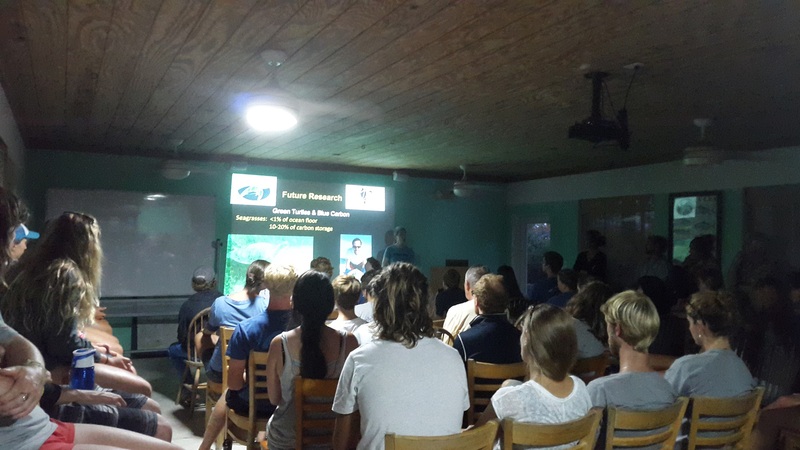 During the first week of May, Cape Eleuthera Institute and the Sea Turtle Research and Conservation Program were honored to welcom Dr. Karen Bjorndal and Dr. Alan Bolten to our facility. Dr. Bjorndal and Dr. Bolten are co-directors of the Archie Carr Center for Sea Turtle Research at the University of Florida and collaborators on the “Tracking Sea Turtles in the Bahamas” Earthwatch program conducted at CEI. Research assistant of the Sea Turtle Research Program, Rachel Miller, watching Dr. Alan Bolten take a biopsy from a green sea turtle caught in Starved Creek, The Bahamas. Dr. Bjorndal and Dr. Bolten came to CEI to discuss the program as well as scout out potential study sites for their newest graduate student to investigate the effect of green sea turtles on the carbon cycle of seagrass beds. They also accompanied the turtle team on a trip to Starved Creek. Here, Drs. 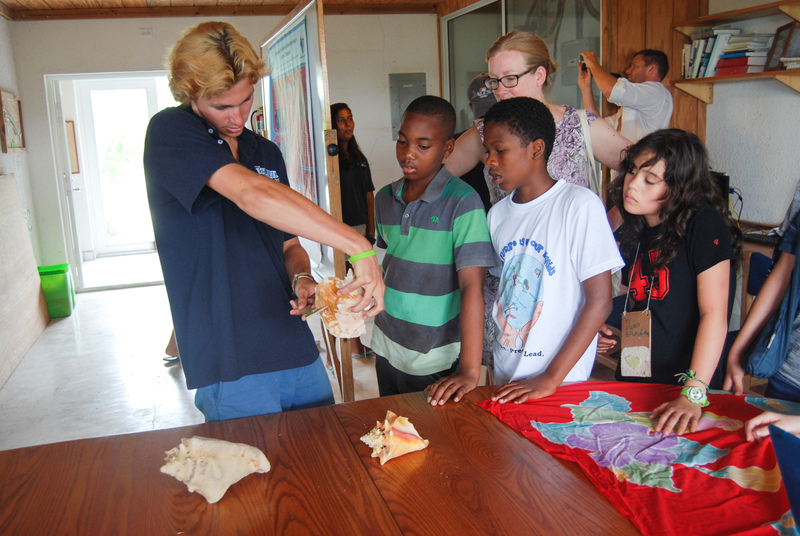 Bjorndal and Bolten taught the turtle team how to take skin biopsies from a sea turtle. 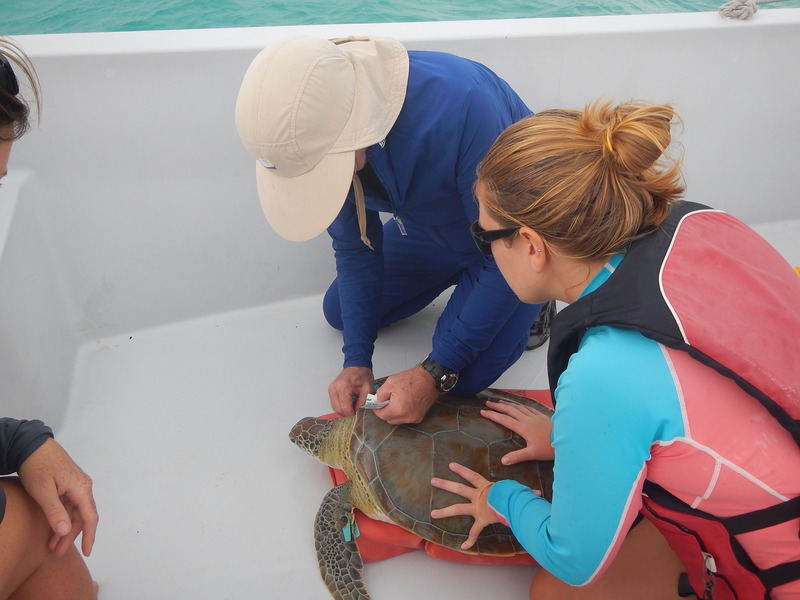 These skin biopsies will be used to conduct stable isotope analysis, an analysis that examines the diet of the turtle, as well as genetic analysis. The genetic analysis will help give the team at CEI an idea of which rookery (nesting area) the sea turtles came from as the green sea turtles feeding off the shores of Eleuthera most likely traveled long distances from their hatching grounds. 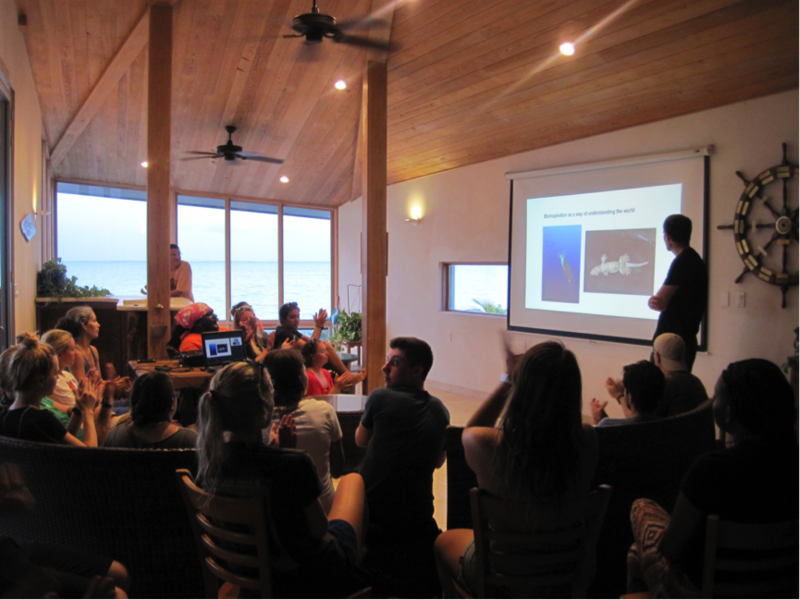 On their final night at CEI, Dr. Bjorndal gave a presentation to the Island School students and staff. Dr. Bjorndal was a doctoral student of Archie Carr, the grandfather of sea turtle research, and her presentation gave background information on sea turtles in the Bahamas and provided insight into the research she has conducted for the last 40+ years in The Bahamas. Dr. Bjorndal initially monitored nutritional ecology of green sea turtles in the early 70’s but this has grown into a long term monitoring program in Inagua, southern Bahamas. She and Dr. Bolten also monitor abundance of sea turtles (green, loggerhead, and hawksbill) as well as growth rates of sea turtles throughout various sites in the Bahamas. The turtle team are grateful for the time they got to spend with these distinguished scientists and look forward to their graduate student joining the team at CEI next year!